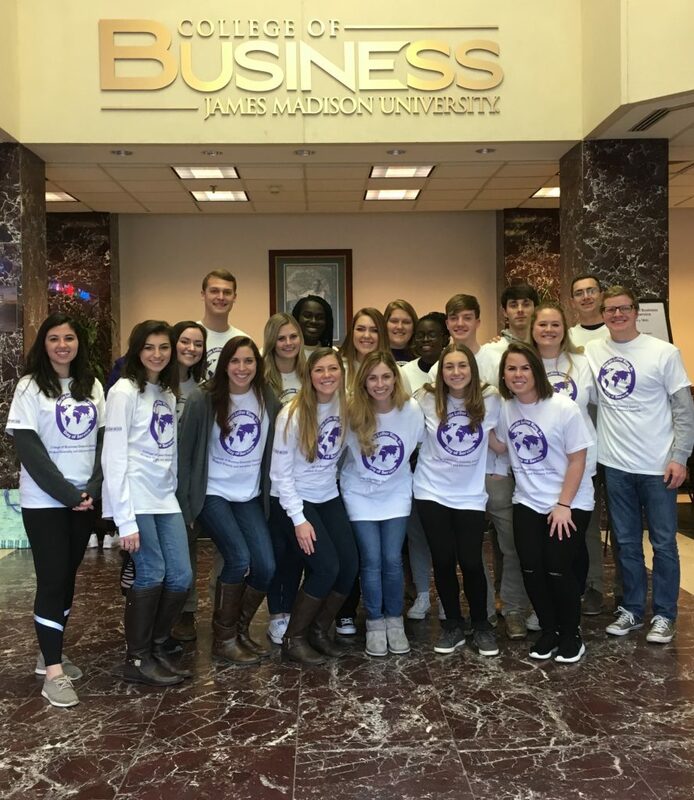 January 16, 2017 by Theresa B. Clarke 0 comments on "JMU Marketing Students Participate in 2nd Annual CoB MLK Jr. Day of Service to Help Local Non-Profit"
The 2017 Google Online Marketing Challenge (GOMC) class was introduced to the MLK Jr. Day of Service during our first class in December. After group discussions during our first meeting, we decided that our skills would be best put to use by continuing the efforts of the GOMC 2016 class, especially since Dr. Clarke encouraged us to use our strengths to give back to the community. 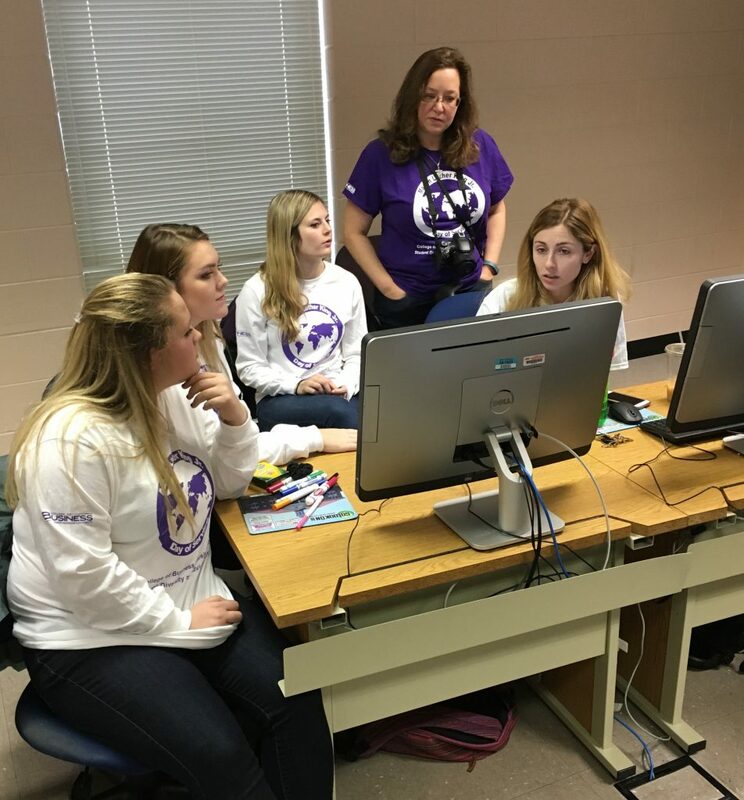 Dr. Clarke coaches Lauren Jones, Allie Hammond, Jordan Kimball, and Annalise Capalbo on the Green Team while they work to solidify their marketing proposal. Last year’s students developed new ideas to promote birthday parties held at the museum. They successfully supplied The Explore More Discovery Museum (EMDM) in Downtown Harrisonburg with marketing plan ideas to increase birthday parties sales. The 2017 GOMC students were excited to pick up where the talented students before them had left off and brainstorm more ideas to help spread awareness of EMDM’s birthday events and increase memberships. 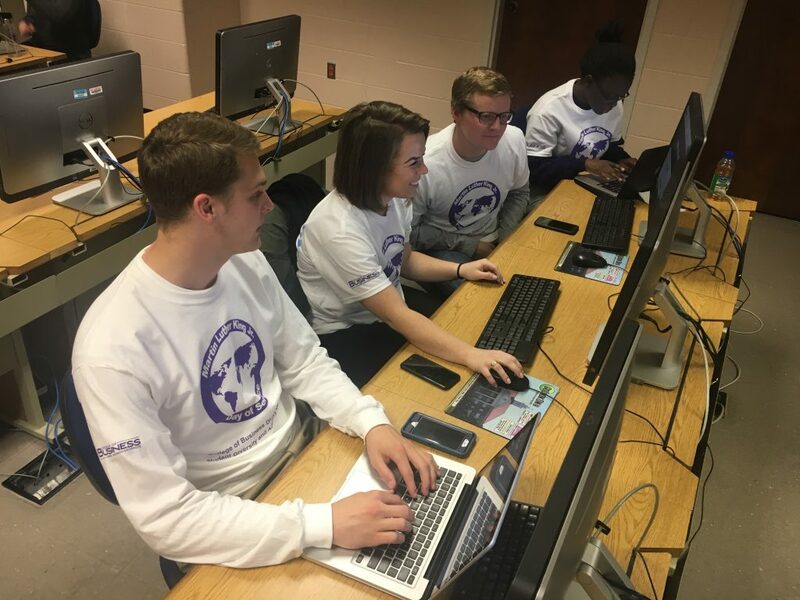 Students were given an opportunity to branch out from their GOMC groups and conceptualize innovative ideas with new teammates, each of which had a different team color assigned to them. 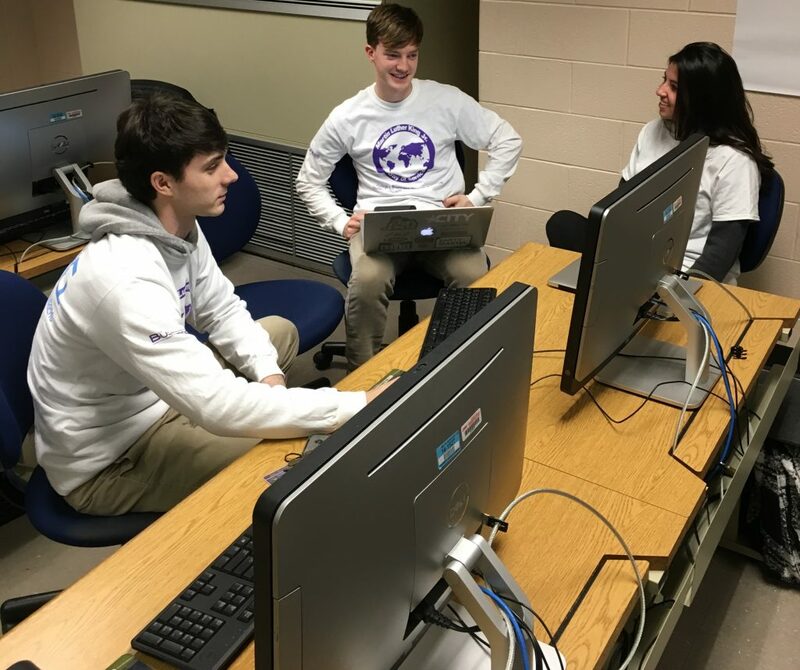 “It was really great getting to know and work with other students in the class that I otherwise wouldn’t have had the opportunity to interact with.” –Riley Jamison, Red Team. David Bruce, Emily Vaeth, Riley Jamison, and Caroline Galiwango of the Red Team bonding and brainstorming for EMDM. Dr. Clarke’s students are given one of four roles for her course: Team Captains, Account Managers, Strategists, and Analysts. Today, she had the “Strategists” step up to lead the teams for the day. All other class members were randomly divided into cross-functional groups to work together on our class goal: converting birthday party participants into members at EMDM, as well as further branding the museum. The 2017 GOMC students made it their mission to discover ways to make EMDM birthday parties more attractive to parents and children and spread the word about the great opportunities EMDM has to offer. This project required each team to utilize their creative talents under strict time constraints. George Shtern, Devon Hogue, and Madeline Divita from the Yellow Team talking about new marketing ideas for the EMDM. The Explore More Discovery Museum has basic party options and additional themes that can be added depending on the child’s interests. Other add-ons include Explore More souvenir cups, ice cream cups and more! The participating students wanted to emphasize that the hard-working staff at EMDM makes birthday parties easy and enjoyable for both parents and children. Continuing branding for the museum is important for museum foot traffic and potential membership opportunities for visitors. As a result of the GOMC MLK Day of Service, several great ideas emerged related to new party themes, coupons/discounts for parents, and small scientific projects to complete at home. Expanding informational materials throughout the facility can be helpful for showing parents and children what other opportunities EMDM offers. Our birthday party enhancement and branding recommendations are low cost and exciting for participants. One common idea that all students supported was a loyalty program to incentivize families returning after attending a birthday party. Participating in service directly related to our skills created a unique experience for the GOMC students. Marketing is not only our area of study but has also become a way for us to give back to the local community. Collaborating with our classmates allowed us to develop great ideas for the EMDM. Students were able to collectively dedicate 50 hours with a clear purpose and goal in mind. It was an exciting and unique service experience that all students had fun participating in. We look forward to seeing this project continue with future GOMC classes!